I enjoy taking care of people, and making sure that their visit is a positive experience from start to finish. 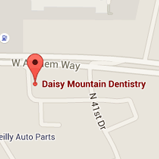 I joined the Daisy Mountain Dentistry team in 2004 and treasure the relationships I’ve developed with our patients. Seeing families at their visits, hearing their latest news, and strengthening our friendships, are all reasons why I love what I do. As our office manager, I oversee all aspects of our practice. By ensuring our days run smoothly, I make it possible for the team to focus on what’s important: our patients’ comfort and smiles! I’m an Arizona native, have been married for 18 years, and have a young daughter. I’m very involved with her tumbling activities. My favorite times are spent with my family, enjoying the great outdoors.